Mega Tiles are great for creating jewelry components, pottery, ceramics or any other project with clay. Our Rolling Frames pair excellent with Mega Tiles. The entire frame sits comfortably on the Mega Tile so there is no rocking or searching for additional textures to hold and level your frames. Since there is plenty of real estate on these tiles, it allows you to pick your favorite part of the texture and comfortably design your piece. Never be limited again by the size of your texture. Great for any project to texture clay - large or small! Use with any soft clay: silver clay, bronze clay, polymer, earthen, porcelain, etc. If you have any questions about this product by Cool Tools, contact us by completing and submitting the form below. If you are looking for a specif part number, please include it with your message. 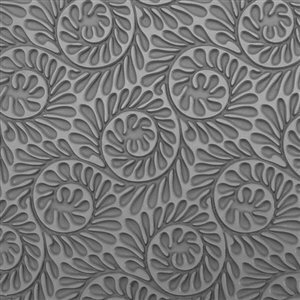 Cabtopia -- Lapidary Jewelry Design Template Stencil "Tension"
Cabtopia -- Lapidary Jewelry Design Template Stencil "Tranquil"
Framework Full Length Texture Sheet, 10in x 2in each of Windows, Bridges, Chevrons, and Arched.